What Are The Negative Effects Of Sitting? According to a study, sitting around for long periods of time has been strongly associated with worsening mental health, increased risk of death from heart disease and other diseases, and increased risk of disabilities. With everything at our fingertips, there are less and less reasons to get up and move around, right? Wrong. Sitting too much has been linked to a number of diseases. Sitting around for long periods of time has been strongly associated with worsening mental health, increased risk of death from heart disease and other diseases, and increased risk of disabilities. However, does too much sitting cause poor health, or is it the other way around? What we do know is that even an hour’s jog may not reverse the effects of eight hours of sitting all day. A study in the American Journal of Preventive Medicine reported that older women who sat more than 11 hours per day were at the highest risk for heart events like heart attack, heart disease, and overall increased death rates. One theory proposed is that sitting for long periods of times causes the muscles to burn less fat. It can also cause the blood to flow more slothfully. A study from Indiana University suggested that during a three-hour period of sitting around, the enlargement of the arteries, as a result of amplified blood flow of the main artery in the legs, was impaired by as much as 50% after just one hour. They also found that individuals who walked for 5 minutes after each hour of sitting had a consistent and stable artery function through the three-hour period. Individuals who were in front of the screen excessively had nearly a 50% increased risk of death from any cause. Individuals who spent four hours in front of the screen had approximately a 125% increased risk of heart-related events like chest pain (angina) or heart attack. It should be understood that sitting in front of the television is not the only worry. Sitting behind a desk at work or driving for long periods of time have the potential to yield the same kind of results. Studies have also shown that sitting may not make you less hungry. This can possibly lead to overeating, which when combined with a lack of substantial physical activity, may affect one’s health adversely. Dunstan, D. W., Barr, E. L. M., Healy, G. N., Salmon, J., Shaw, J. E., Balkau, B., ... & Owen, N. (2010). Television viewing time and mortality the australian diabetes, obesity and lifestyle study (AusDiab). Circulation, 121(3), 384-391. Levine JA, et al. Move a Little, Lose a Lot. New York, N.Y.: Crown Publishing Group; 2009:26. Matthews, C. E., George, S. M., Moore, S. C., Bowles, H. R., Blair, A., Park, Y., ... & Schatzkin, A. (2012). Amount of time spent in sedentary behaviors and cause-specific mortality in US adults. The American journal of clinical nutrition, ajcn-019620. Stamatakis, E., Hamer, M., & Dunstan, D. W. (2011). Screen-Based Entertainment Time, All-Cause Mortality, and Cardiovascular EventsPopulation-Based Study With Ongoing Mortality and Hospital Events Follow-Up. Journal of the American College of Cardiology, 57(3), 292-299. Thosar, S. S., Bielko, S. L., Mather, K. J., Johnston, J. D., & Wallace, J. P. (2014). Effect of Prolonged Sitting and Breaks in Sitting Time on Endothelial Function. Medicine and science in sports and exercise. Van Uffelen, J. G., Wong, J., Chau, J. Y., van der Ploeg, H. P., Riphagen, I., Gilson, N. D., ... & Gardiner, P. A. (2010). 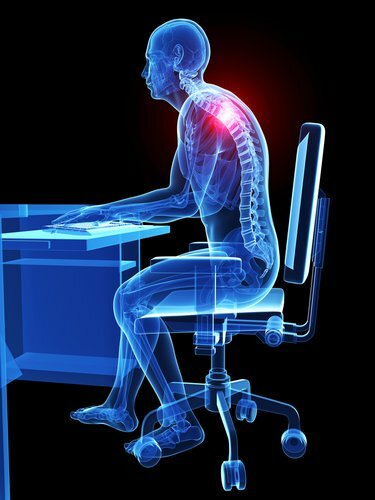 Occupational sitting and health risks: a systematic review. American journal of preventive medicine, 39(4), 379-388. Dunstan, D. W., Howard, B., Healy, G. N., & Owen, N. (2012). Too much sitting–a health hazard. Diabetes research and clinical practice, 97(3), 368-376. Owen, N., Bauman, A., & Brown, W. (2009). Too much sitting: a novel and important predictor of chronic disease risk?. British journal of sports medicine, 43(2), 81-83. Hamilton, M. T., Healy, G. N., Dunstan, D. W., Zderic, T. W., & Owen, N. (2008). Too little exercise and too much sitting: inactivity physiology and the need for new recommendations on sedentary behavior. Current cardiovascular risk reports, 2(4), 292-298. Thorp, A. A., Owen, N., Neuhaus, M., & Dunstan, D. W. (2011). Sedentary behaviors and subsequent health outcomes in adults: a systematic review of longitudinal studies, 1996–2011. American journal of preventive medicine,41(2), 207-215. Gilson, N. D., Burton, N. W., Van Uffelen, J. G., & Brown, W. J. (2011). Occupational sitting time: employees? perceptions of health risks and intervention strategies. Health Promotion Journal of Australia, 22(1), 38-43.